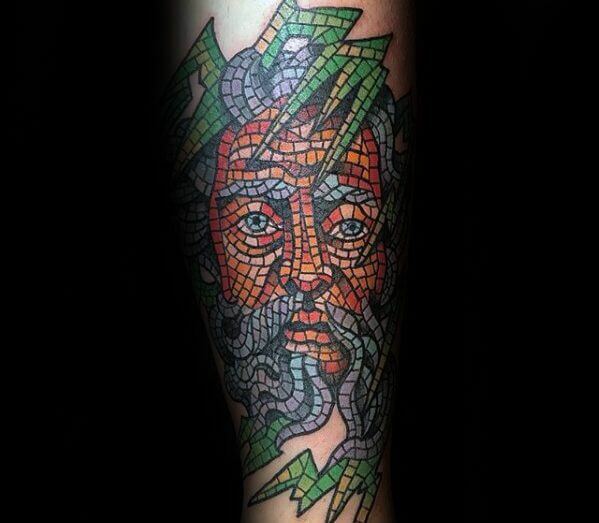 It is often said that the devil is in the details and that is the fundamental guiding force behind mosaic tattoos for men. They can be very rich in detail and very eye-catching. 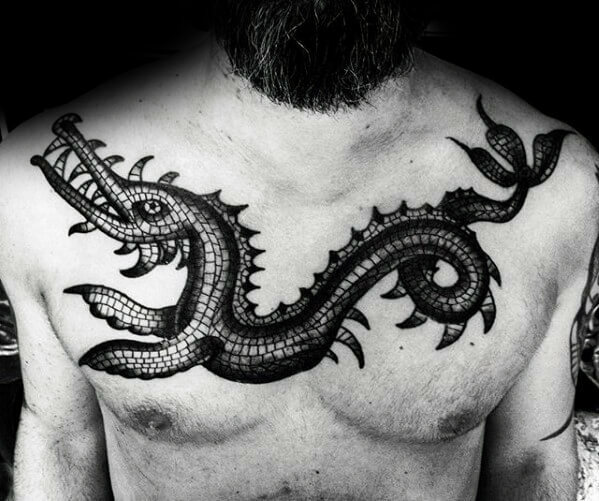 Their deep and meaningful nature combined with an aura of high artistic caliber has seen them claim a significant portion of the men’s tattoo world. 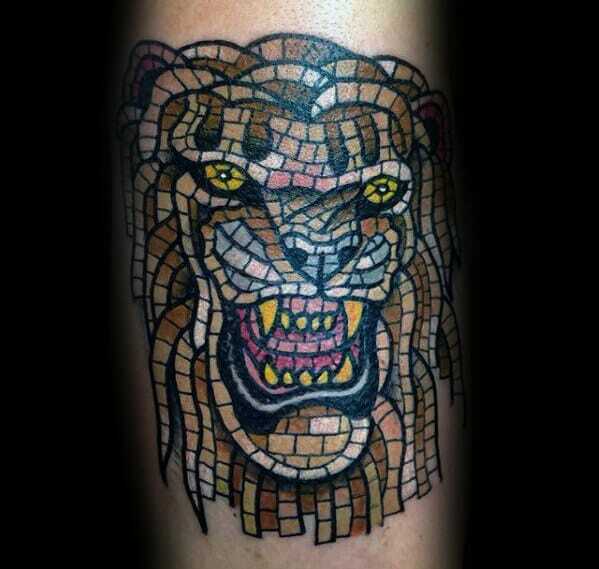 Today we will look at what exactly a mosaic tattoo is and why it has become such a popular choice. 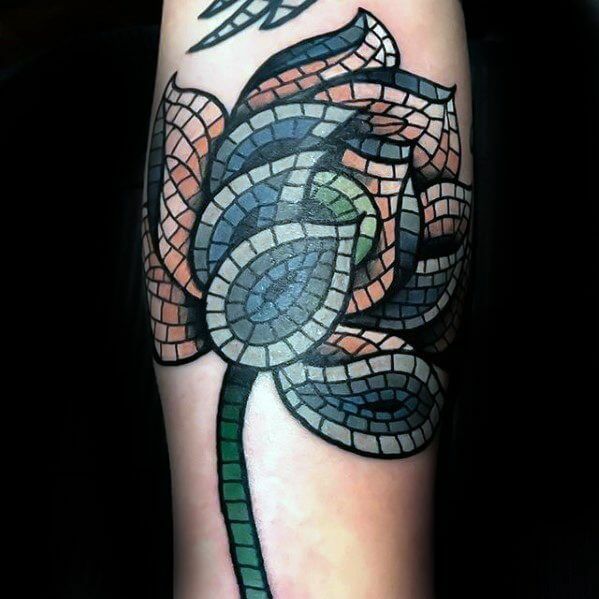 Mosaic tattoos were inspired by mosaic art that originated over 5000 years ago. 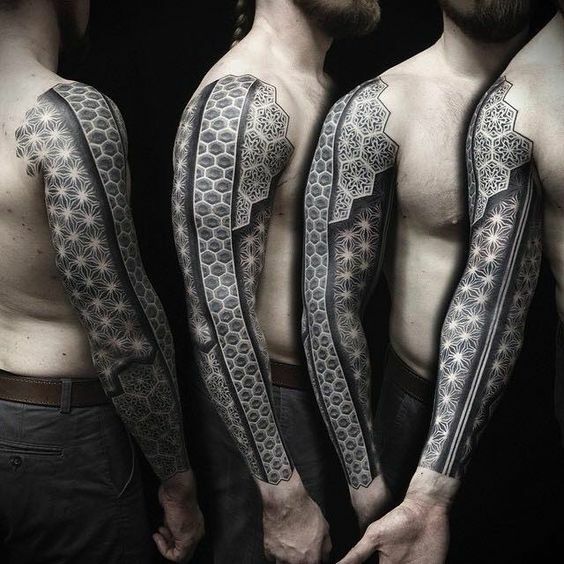 Back then it was not in the form of tattoos but the fundamental design techniques have been perfected over the millenniums and today we have a rich and varied art form in our hands. When this rich legacy is applied to tattoos, it can create truly breathtaking and amazingly detailed and varied tattoos. They have the unique visual aspect of changing their looks depending on how closely they are observed. This feature makes it a truly unique breed of a tattoo. 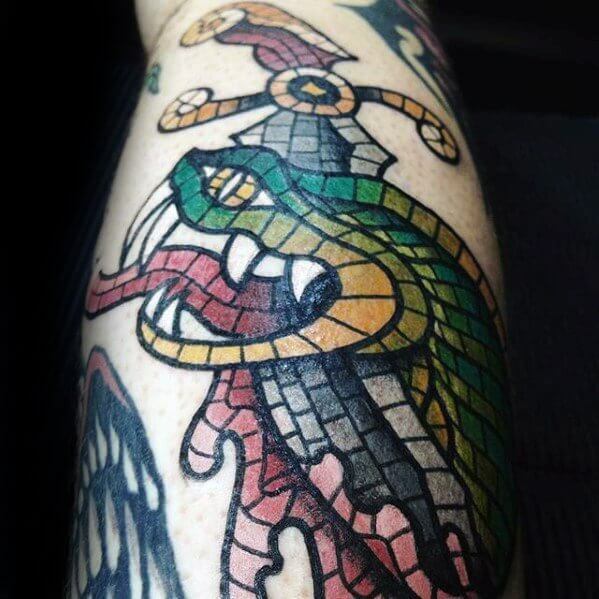 Almost every culture has some form of mosaic art and that makes the mosaic tattoos for men a truly universal symbol of art and something that can be personalized to a very high degree. People get tattoos for two primary reasons. The first being the aesthetic appeal and the second being an artistic representation of either their thoughts or their personalities. 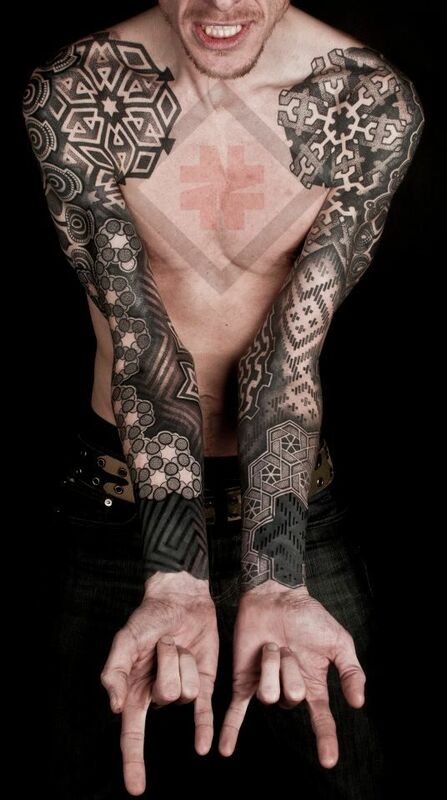 Mosaic tattoos for men can achieve both these objectives really well. As they are made of tiny and individual sections and a single tattoo can comprise of a huge number of these components, they are rich, packed with detail and can incorporate a level of depth, realism, and details that are very rare among tattoos. They are also multi-faceted as they appear different from different distances and in this regards they are somewhat like a book that is slowly unfolding. All this makes these tattoos a true work of art. 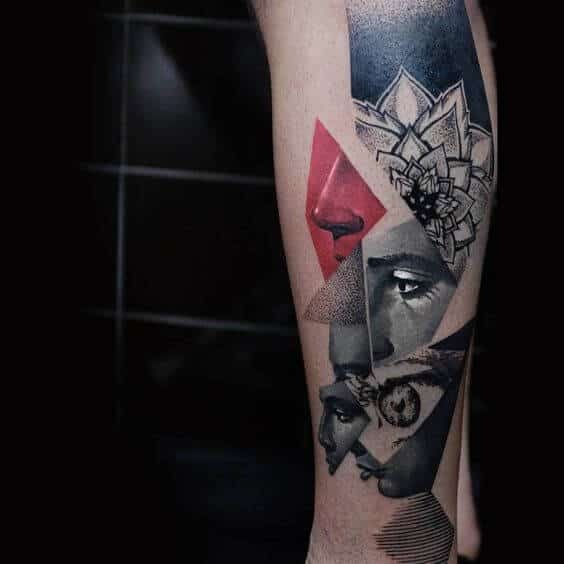 Then comes their informative nature – as they are made up of a large number of individual pieces, they can tell a story or evoke an emotion a lot better than a regular tattoo. They can also be personalized to a great degree and a much larger color palette can be used to truly depict your personality. They can also be made very eye-catching and appealing and all this combines to produce a tattoo that will leave a lasting impression on even the most casual observer. These tattoos are the perfect body art and style accessory for the highly complicated man with multiple facets. If you like to party wildly but also work hard then this tattoo will perfectly complement you. If you are the complete package and enjoy doing a lot of different things and have an incredible depth to your thought process then these tattoos are definitely worth a look. Finally, if you want a tattoo that appears highly complicated and incredibly detailed from a certain distance and really simple yet aesthetically pleasing from another then few tattoos can suit your requirements as well as these tattoos. 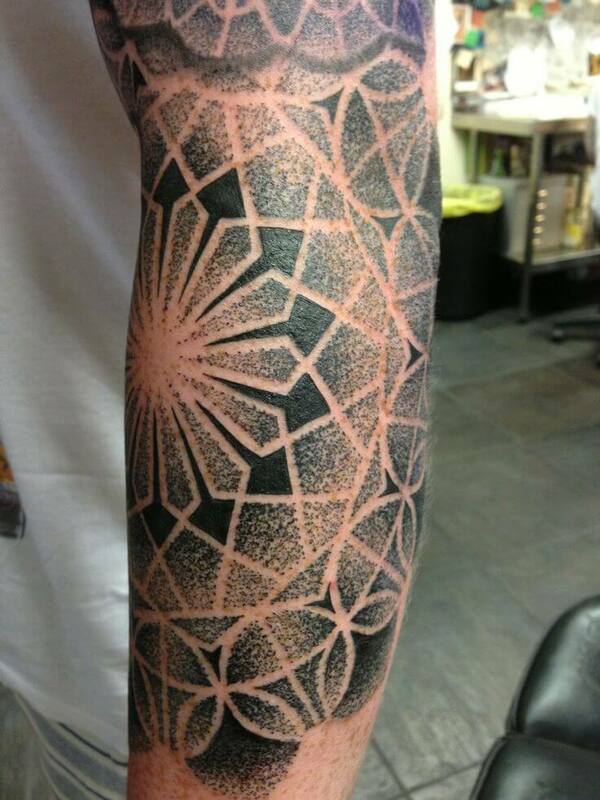 This tattoo on the forearm is truly a work of art; it is mostly in black with the odd burst of pink for a special touch. 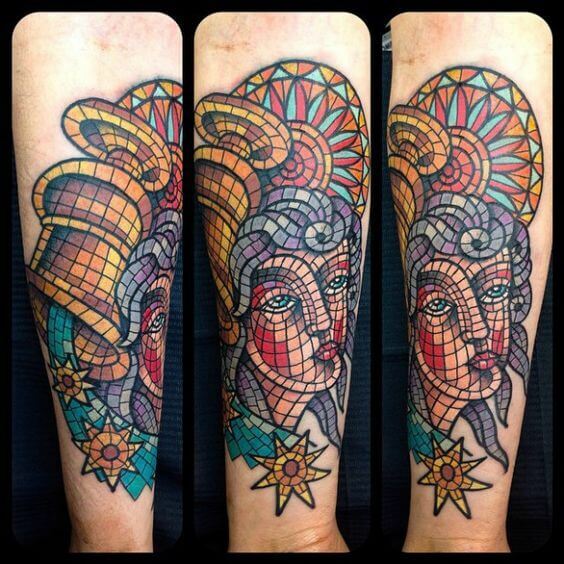 The inking is made up of geometric shapes meshed together with a pretty and detailed face featured in the design. 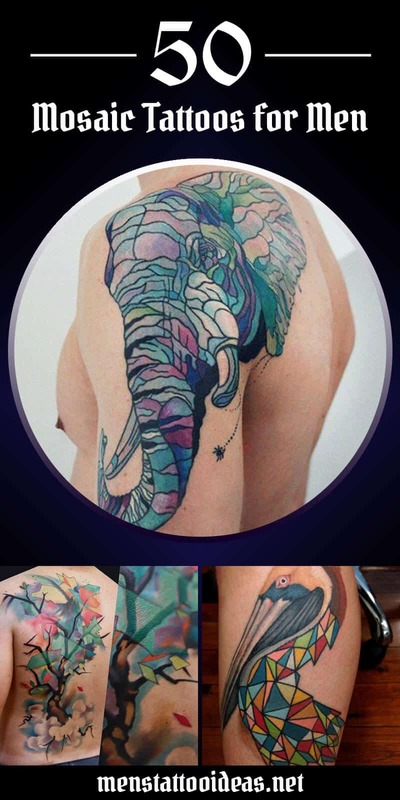 This mosaic tattoo design is primarily of an elephant, with some other pictures added into the mix. The grey and black mosaic comes together nicely with the trunk of the animal in the middle and an interesting third eye. 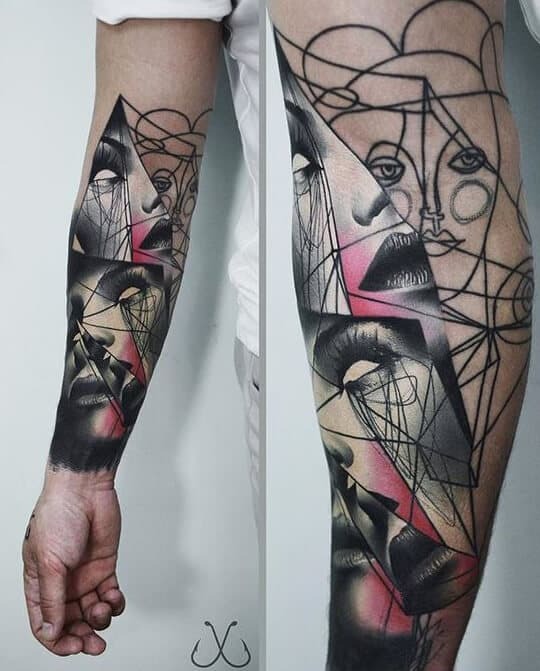 This tattoo has lots of different features of the face joined together to make one design, it almost looks like pieces of several tattoos put together. It’s a very eye catching piece that is sure to be a talking point with anyone who sees it. 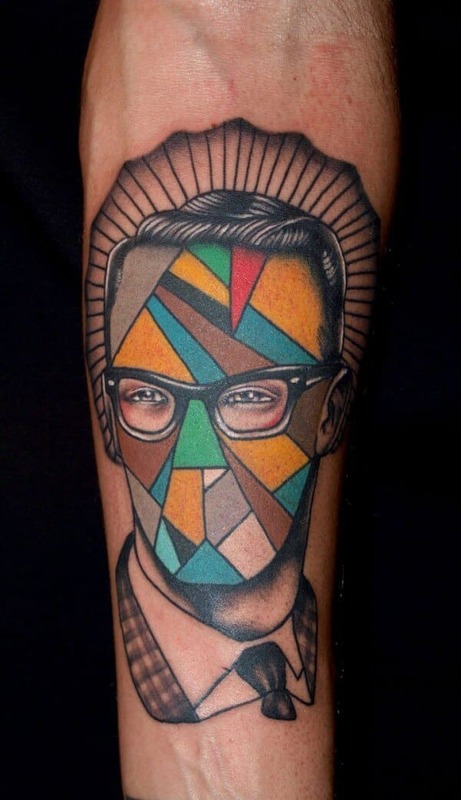 If you are looking for a colorful mosaic tattoo that oozes character, this portrait style piece is ideal. It features many bright shapes that eventually accumulate in the picture of a person. This is a very detailed piece that has been designed really well. Any lover of animals will be happy with this mosaic design of a blue elephant. The use of shapes and colors is done really well, yet the inking manages to stay quite simple. 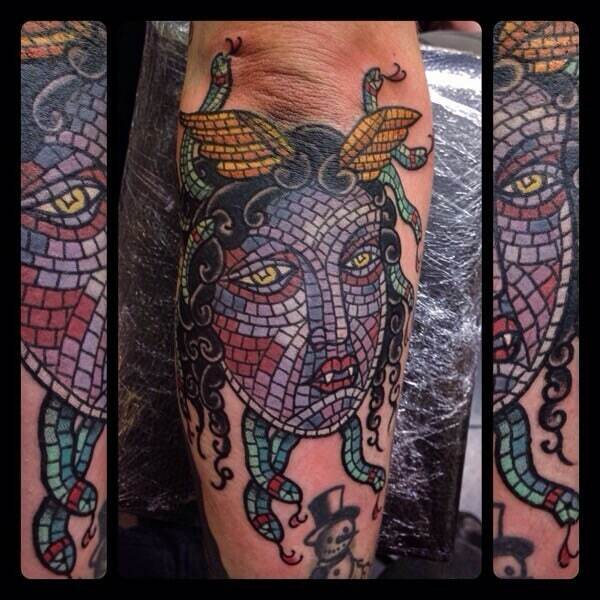 This is one of the more subtle mosaic tattoos but it still looks really good. Blacks and greys have been used to create this piece, which manages to look quite manly and tribal in some ways too. This tattoo is a one off piece that will spark conversation because it shows off such personality. Colorful geometric shapes are used to create this portrait of a man, apart from his eyes and clothing which look exactly as they should. If you are looking for tattoo ideas for men, this design of a lizard looks really good and stands out. Bright and beautiful primary colors make this piece come together and it’s a design that is definitely worth taking notice of. 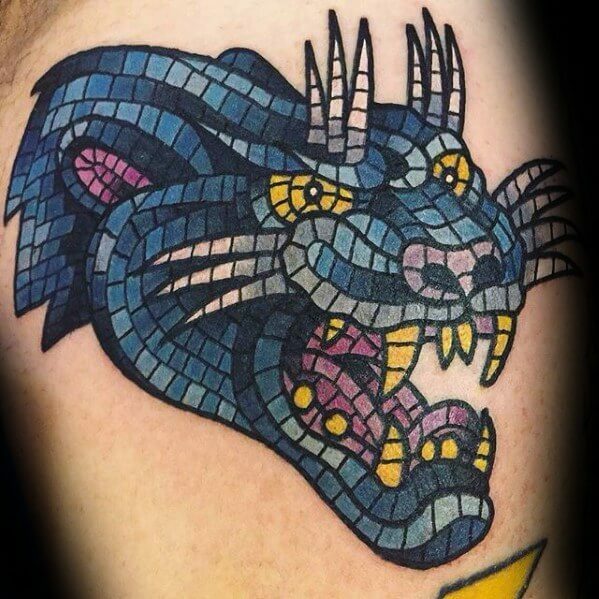 This tattoo is an array of amazing colors with mosaic shapes, creating the picture of a cat. It’s a very interesting design and you can guarantee that you are going to stand out from the crowd with this big piece. 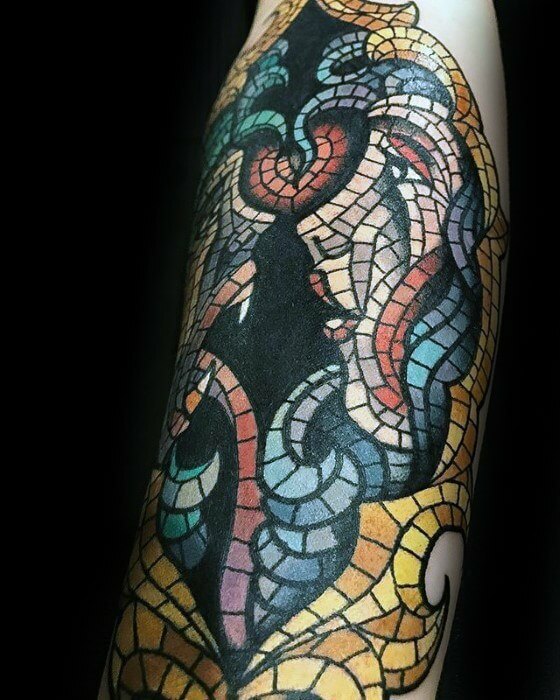 For a bold piece that covers your entire arm, this mosaic tattoos idea is ideal. Blacks and blue are used to create this amazing design, which is so detailed that it almost looks like it is coming out of the skin. This tattoo is truly a piece of art and would suit a variety of men out there. Shapes are used to create a magnificent piece of inking that starts off at the shoulder, spreading down the bicep and the rest of the arm. 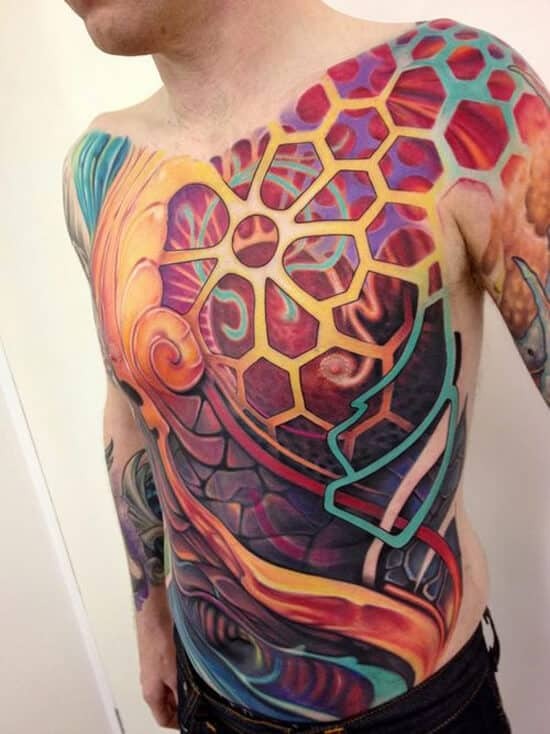 If subtlety is not your strong point, say it proudly with this colorful tattoo that takes up all the chest area and stomach. The yellow is the baseline for the inking and it makes the rest of the tattoo appear 3D. 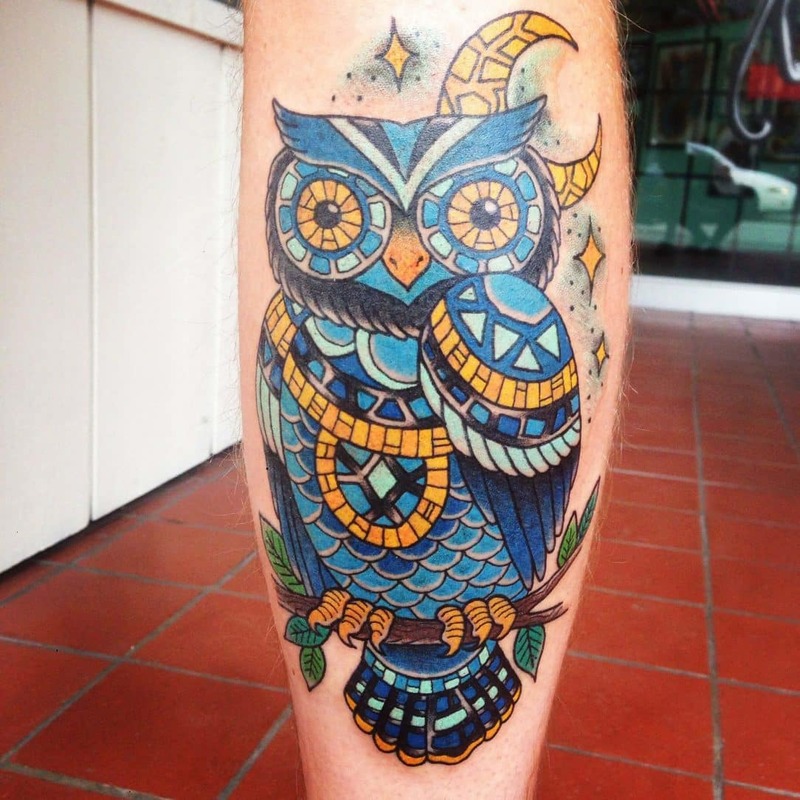 Showcase your love of owls with this big and bright mosaic tattoo ideas. Blue tiles are used to create the owl, with some yellow detailing to make him come to life. This tattoo is guaranteed to be a talking point. Thick line work and clever shading is used in this tattoo in order to really give it some character. 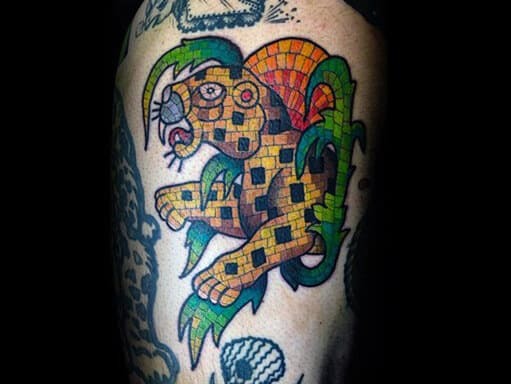 The simply colored inking is ideal if you are looking for mosaic tattoos for guys and you are lacking on ideas. If you are looking for a fierce inking that makes a statement, this large lion is definitely that. A load of small and colored mosaic tiles are used to create the picture of the animal and the end result is amazing. 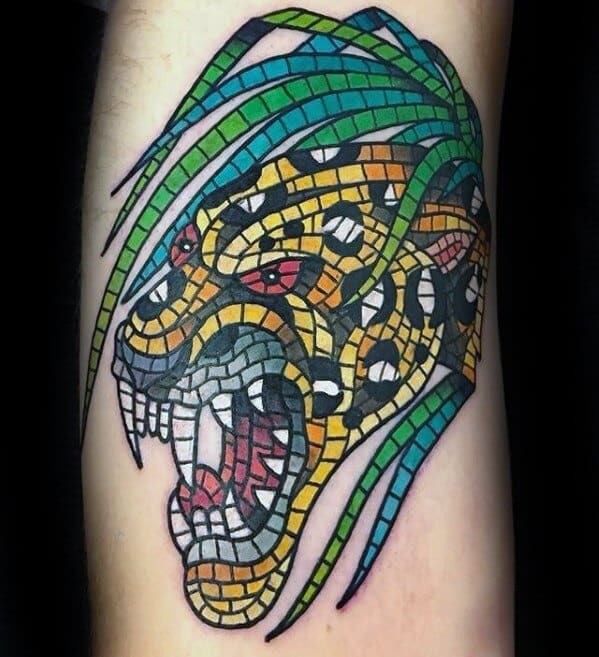 This animal mosaic tattoo is of a jaguar and it looks simply amazing. A variety of squares and other shapes are used in different colors to make this beautiful piece of art. 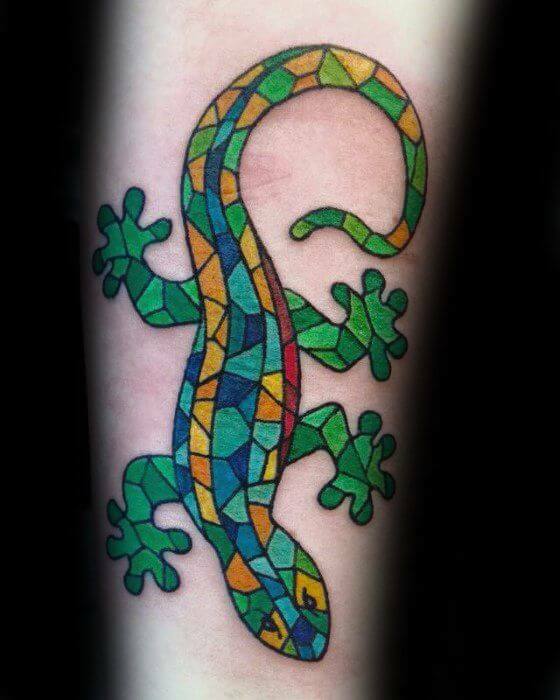 If you are looking for mosaic tattoos for men that stand out, this piece is ideal. 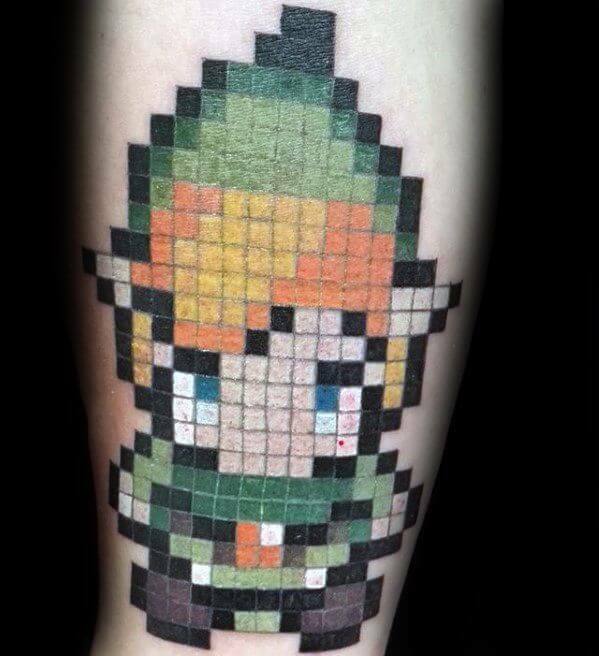 Different colored squares are used to create this character, which looks like a character from a video game and it’s even designed in a pixelated effect. 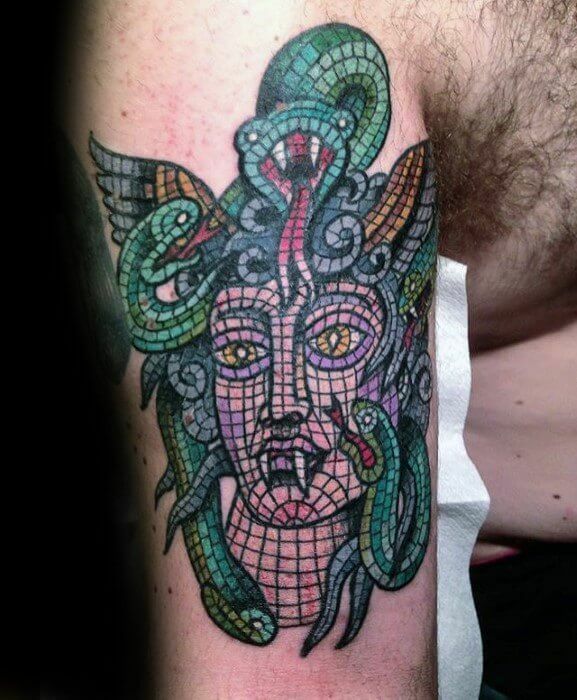 This tattoo is a mosaic effect to make up the picture of a woman with snakes coming out of his head. It’s very detailed and a very interesting piece that is sure to be a talking point with those in your life. If you want a tattoo that is a little darker in its vibes, this inking of a creature with blood coming out of his mouth is perfect. A variety of colors and used in this design and it’s created very well for a beautiful piece of art. 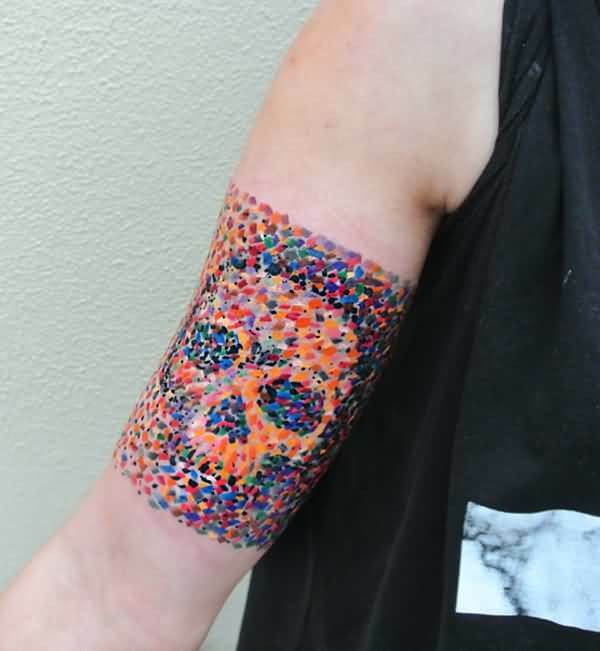 Cover your entire arm with this colorful 3d mosaic pattern for an eye catching piece that is definitely unique in its style. The shading on this design is perfect and it’s apparent that a lot of love has gone into the intricate design. This is a really eye catching tattoos ideas which is done purely in black ink. The tattoo takes up the entire shoulders, chest and down the arms. Mosaic patterns are used to create an attractive design that stands out from the crowd. If you are a guy who wears his heart on his sleeve, this design is perfect for showing off that side of you. 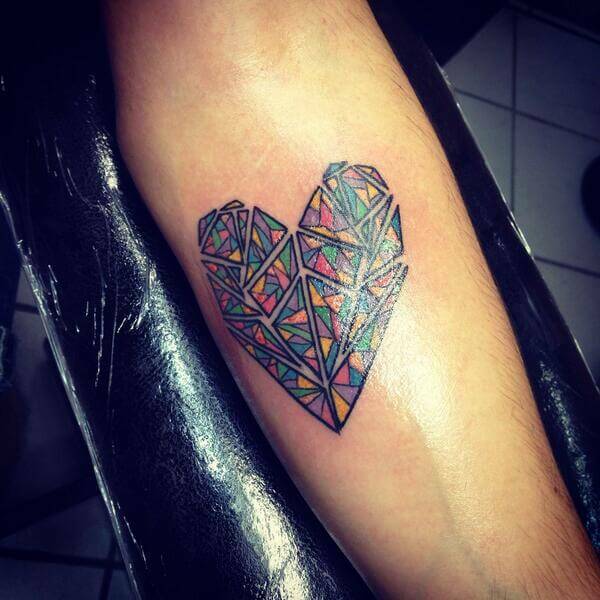 Small geometric shapes are used, coming together to create the simple mosaic heart which is quite unique for a guy. 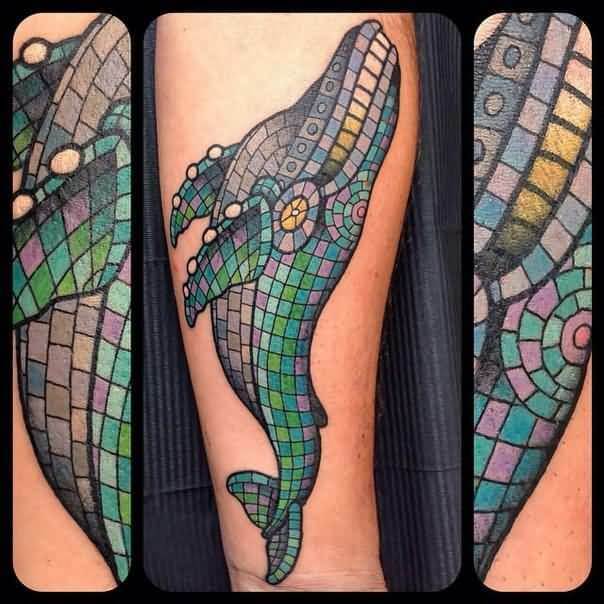 This beautiful tattoo of a whale is created using smaller and delicate shapes. It is blue in color and looks really delicate on the skin. The inking might be perfect for you if you are a fan of animals and particularly sea creatures. 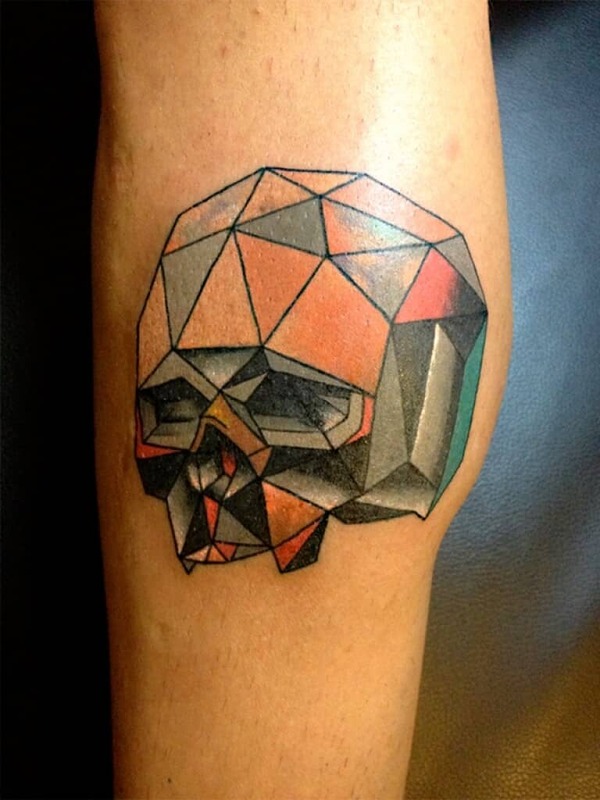 This skull looks cool with it’s mosaic effect, plus the orange and grey colors. The shading is cleverly used in the eyes and nose of the skull to give a 3 dimensional effect that makes it look ultra-cool. If you are really a fan of mosaic and want to go overboard in your tattoo design, why not go for this inking which takes up the entire body? Different shades of blacks are used to create an amazing, stand out pattern. 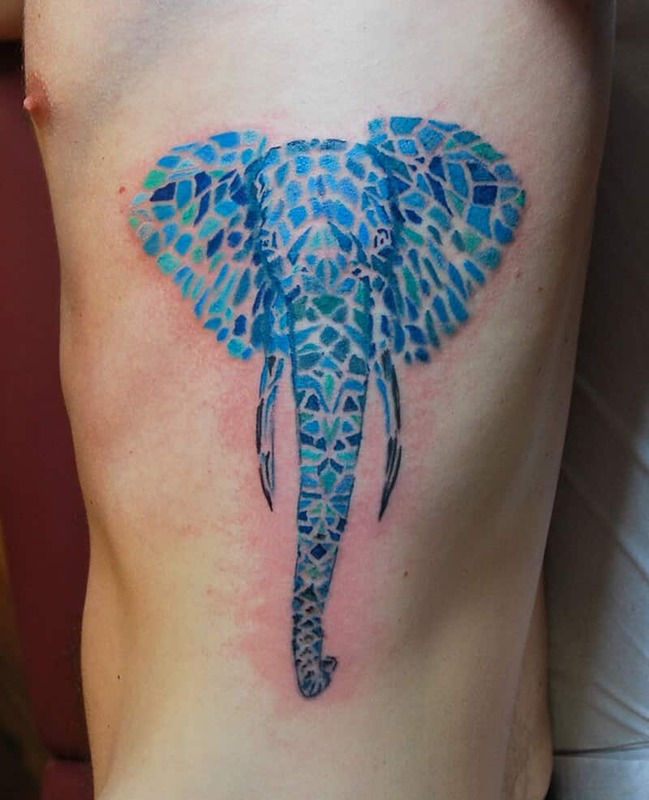 This mosaic tattoo is an adorable drawing of an elephant’s head on the upper arm. 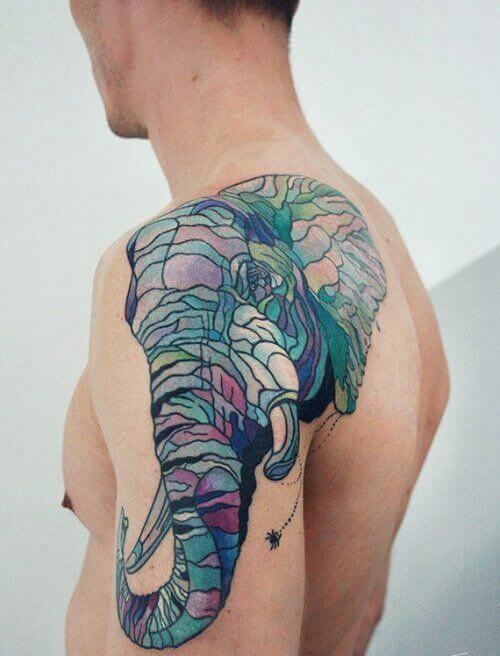 The perfect blending of colors makes the tattoo colorful. It is a huge tattoo that extends to part of the upper back. Nice tattoo for men who admire nature. 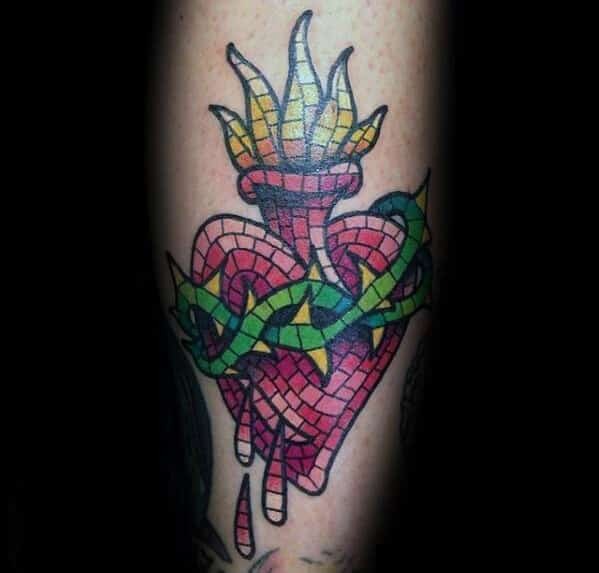 One of the unique mosaic tattoos that fit perfectly on the anterior lower arm. It resembles the head of a bird drawn in the side view. The pattern on the lower part combines a variety of colors to complete the shape of a bird’s neck. 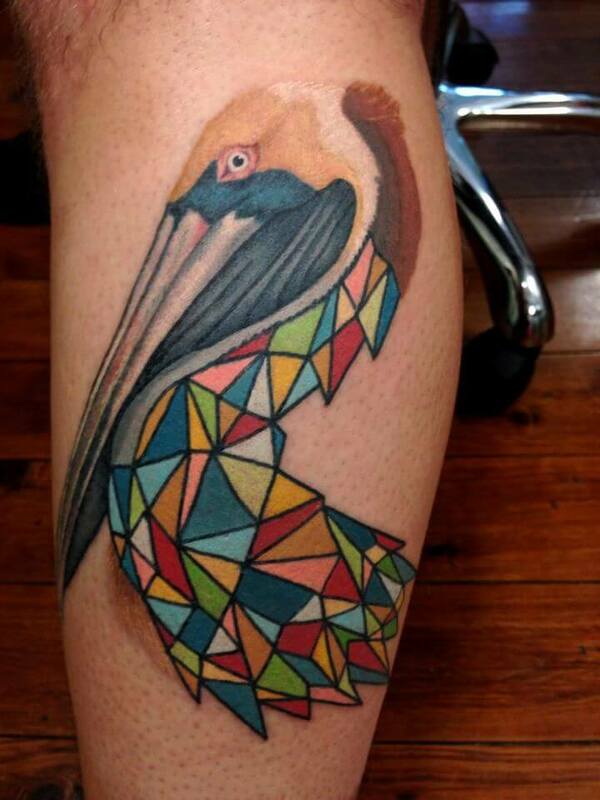 Yet another piece of awesome mosaic tattoo ideas for nature lovers. This tattoo is big in size, covering the better part of one’s back. It is an artistic impression of a tree with branches. The drawing is appealing to the eyes as it uses attractive colors to represent nature. 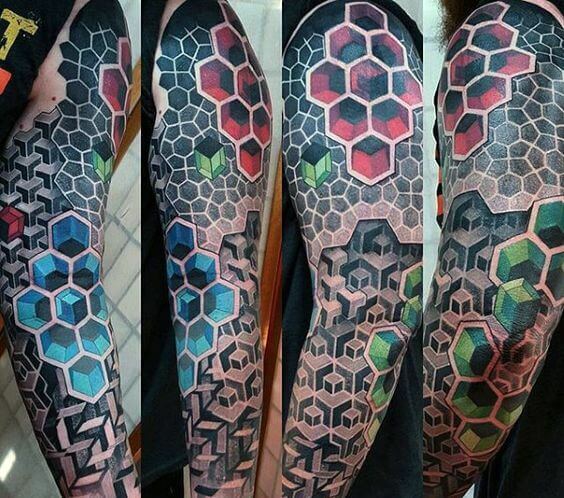 This is a creative mosaic tattoos idea that covers the upper part of the lower arm. It is a drawing of green intertwined twigs that attach to a heart-shaped component. A yellow floral element extends from the upper part of the tattoo. 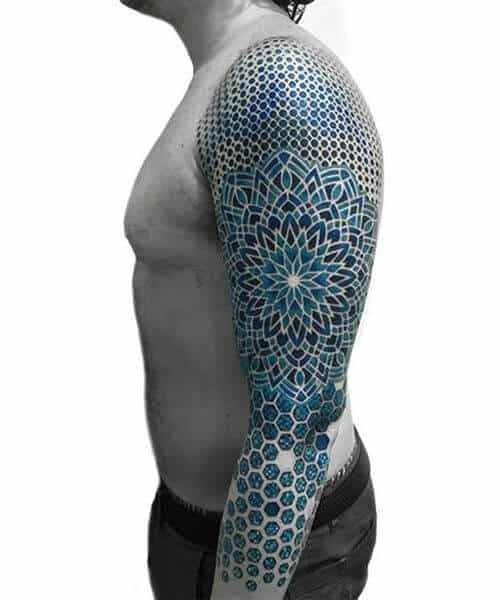 Most men will find this mosaic tattoo design superb. 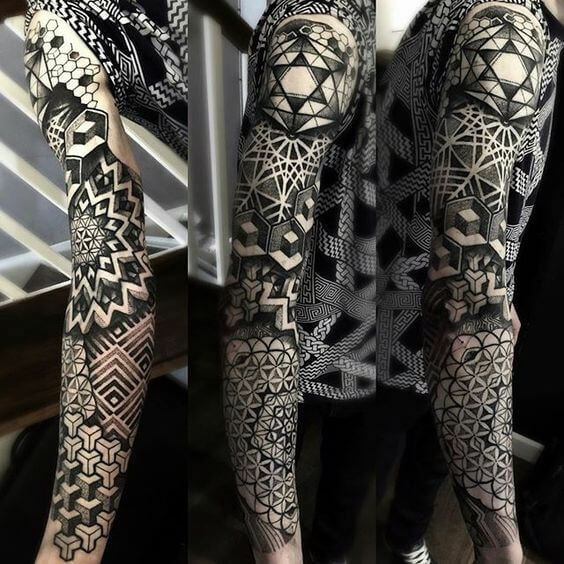 It consists of a black and white pattern that covers the whole arm. The pattern consists of many dark spots that are arranged adjacent to each other between dark lines. It resembles the pattern on a leopard’s skin. 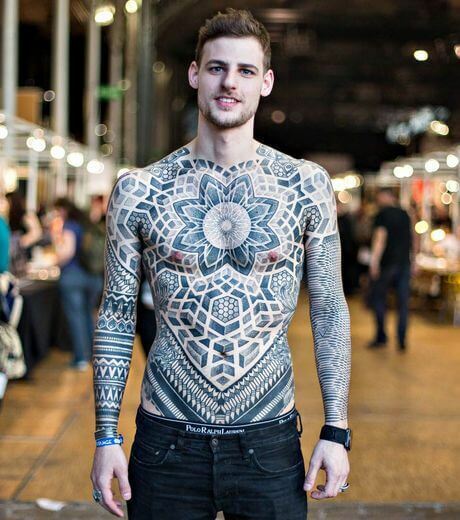 Such a wonderful sample of mosaic tattoos for guys. It is the image of a man’s face that is inscribed with a stone-like pattern. The artistic representation of the hair using blue and green colors makes it catchy. It suits the lower arm perfectly. 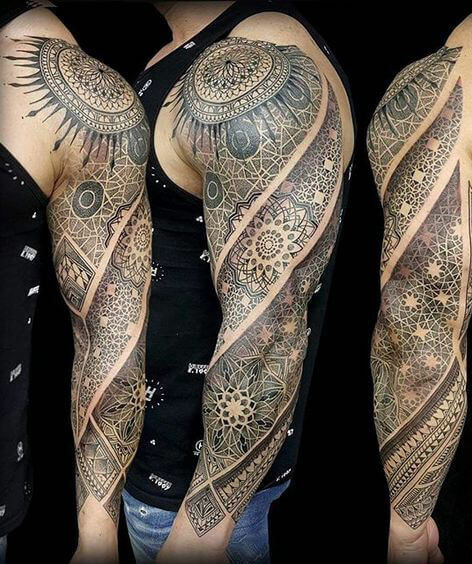 Another mosaic tattoo for men that covers the whole arm, it also adheres to a black and white pattern with dark spots that differ in size and shape. Part of the tattoo on the shoulder resembles the pattern and shape of a ball. 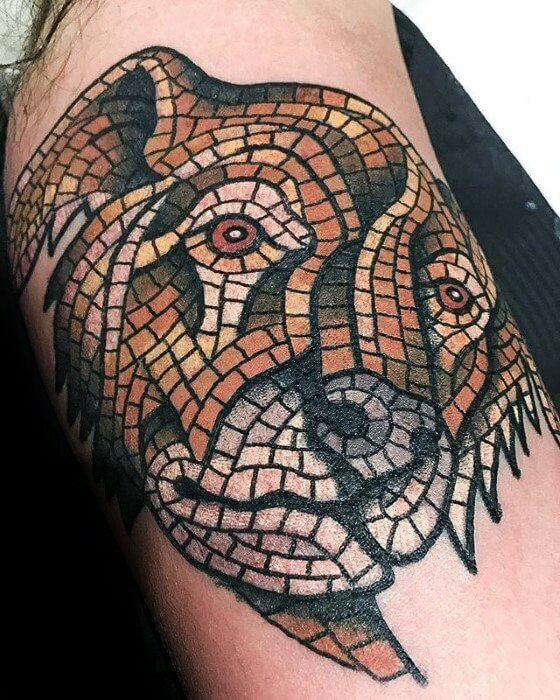 Adorable tattoo concept that resembles a head of a dog, the designer has used a nice pattern to create the impression of a dog on the arm. The use of a single color makes it perfect for men who prefer plain but attractive tattoos. Fierce but quite stylish, isn’t it? 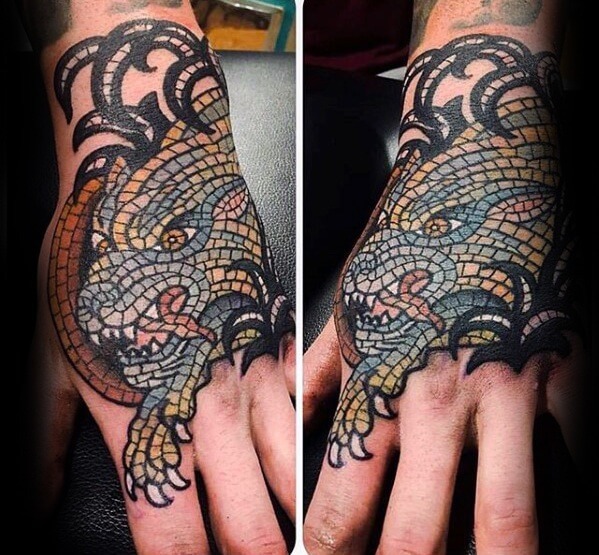 This tattoo appears to be the head of a dragon. It seems furious as evidenced by the sharp canines. It combines a few colors, with blue and brown dominating. It suits men who want to show how brave they are. What an innovative art! 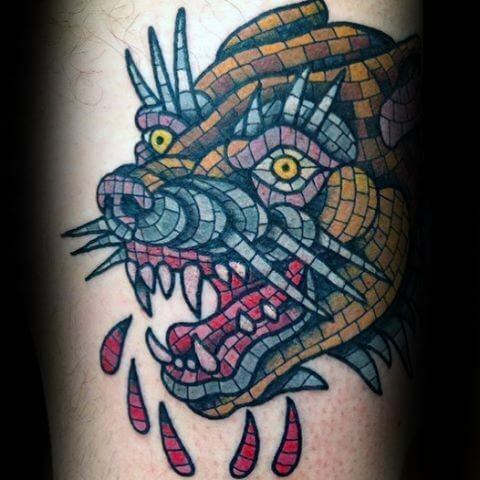 This tattoo consists of a drawing of the anterior part of a carnivore. The creature appears to emerge from a cave surrounded by leafy elements. It blends many colors to make it attractive and clearly visible. 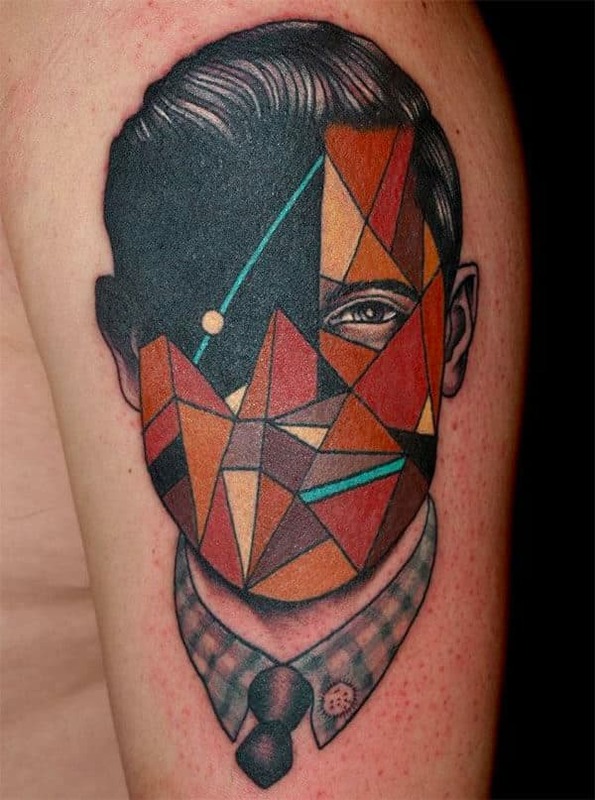 The use of red ink to paint the face of a man in this tattoo makes it a bit scary. The face has horns extending from the upper part and two sharp and tall canines protruding from the mouth. A snake-like creature can be seen curling around the horns, making it more fairy. This tattoo concept is a combination of many features that decorate the upper side-arm. The upper part consists of a chain enclosing a dark feature. The lower part blends yellow, red and blue colors to form a curly feature with a uniform pattern. 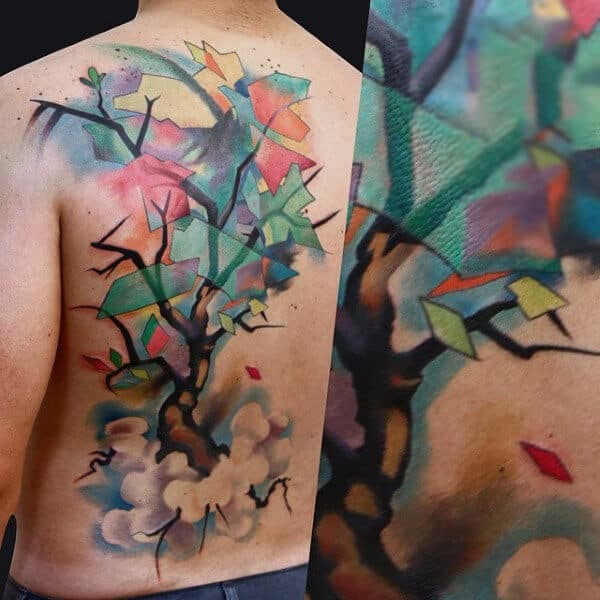 Here is a superb tattoo that resembles a floral element. It combines a variety of colors to mark different elements of the floral component. The floral element appears to be at the top tip of a twig. This tattoo is a drawing of a carnivore on the upper palm. It seems fierce with sharp claws extending to the base of the fingers. Having it tattooed on both hands is one of the best tattoo ideas for men. Both the upper and lower parts of this tattoo have sharp black extensions. Best of all tattoos ideas! 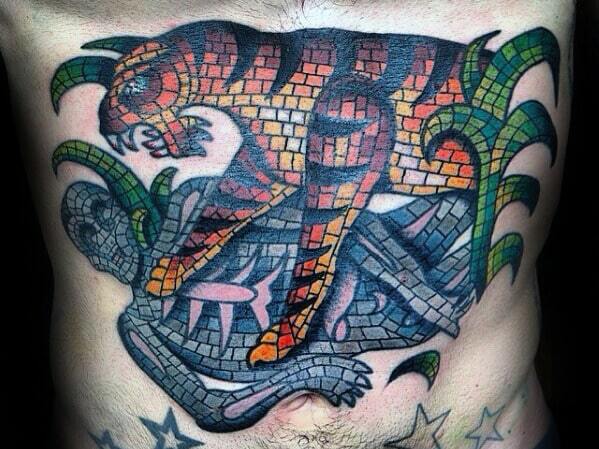 The designer of this tattoo uses art to create the impression of a tiger attacking a human being. The two animal figures have distinct patterns and colors that identify them as two separate entities. The bottom part of the tattoo has some drawn stars and a moon. 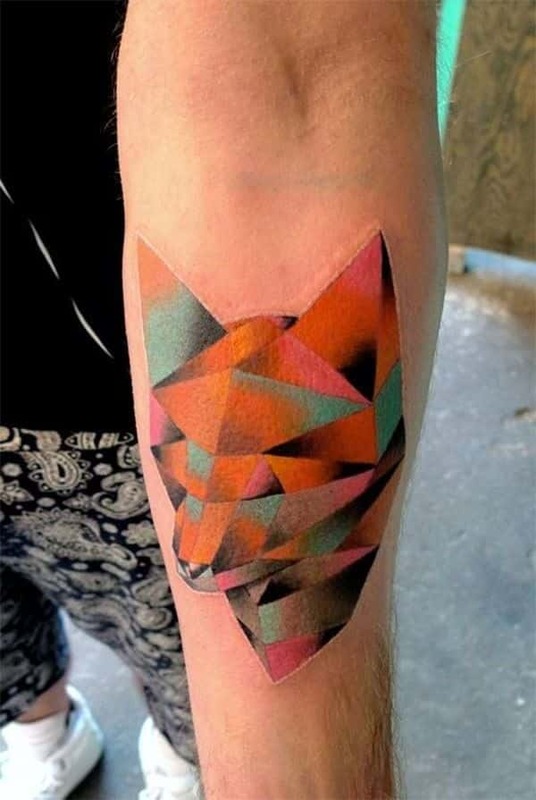 Tattoo resembles the face of a fox. It is unique in that it consists of pyramidal shapes that have been stacked together to make the shape distinct. It is medium sized and fits perfectly on the upper side of the arm below the elbow. A fierce impression created by drawing a cheetah with its mouth wide open to expose the sharp canines best describes this tattoo. On the upper and lower parts are blue and green grass-like extensions. The black and yellow pattern on the animal’s face makes it attractive. Simple and precise design of a tattoo that is quite innovative. 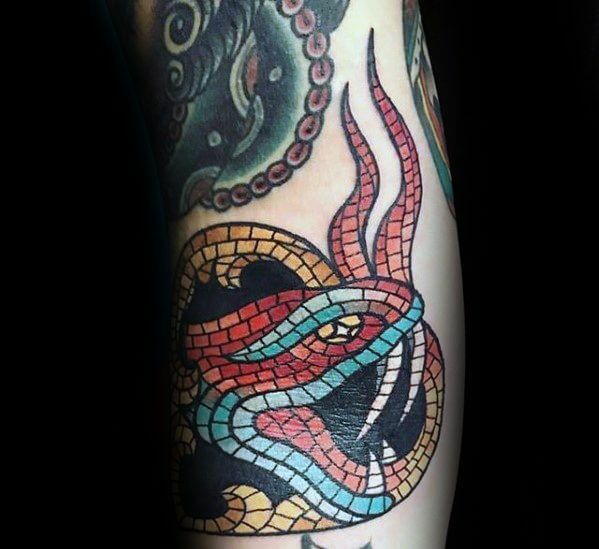 It covers a section of the upper arm, with the image of a skull appearing to be formed by the pattern and colors used. The section covered by the tattoo is uniformly bound around the arm. 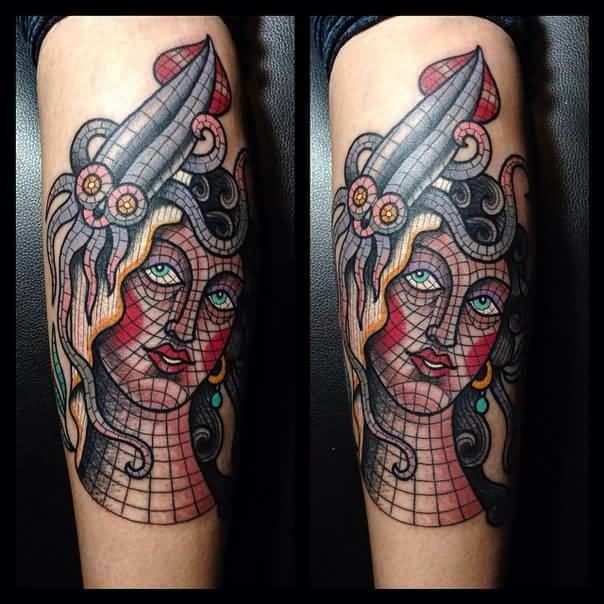 A nice tattoo that resembles the face of a lady with a squid on her head, the face and neck are characterized by a meshed pattern. The use of red color on both sides of the cheeks to paint the circular patches and around the lips makes the lady and the whole tattoo adorable. This drawing appears to be shaped as the face of a man. One eye is visible while the other seems to be overshadowed by the black patch extending upwards. Only three features – an eye, ears, and hair – are clearly visible and make the tattoo a real man’s face. 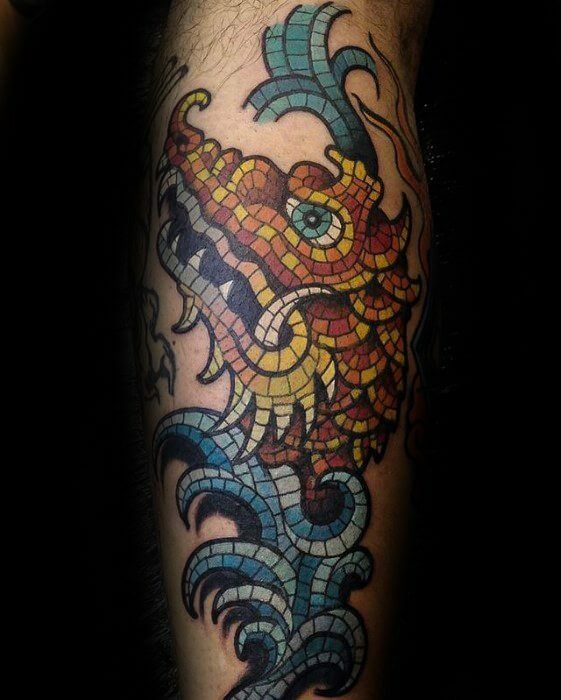 This is a colorful tattoo that has combined several covers to paint the shape of a dragon’s head viewing from the side. The dragon is furious and has its mouth wide open, exposing sharp teeth and a tongue. 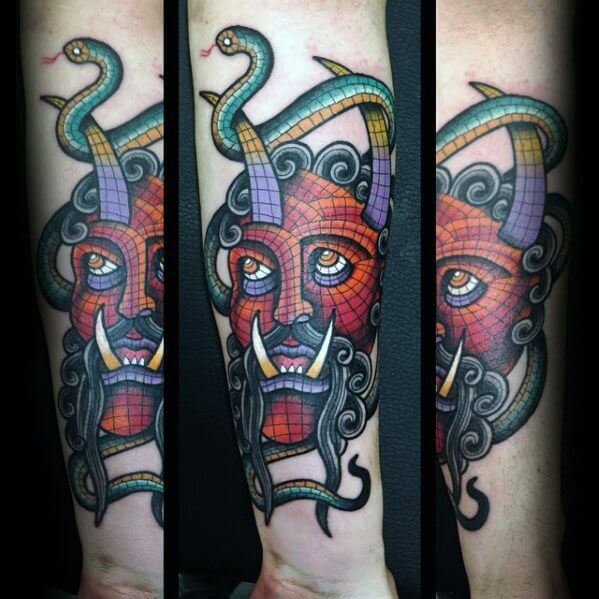 A wide tattoo that covers the whole chest, the creature portrayed is complex. It has the head of a dinosaur but the body is cylindrical like a snake. Surprisingly, it has a pair of fins making it have some features of a fish. The upper surface of the creature is serrated and its tail branches into three protrusions. 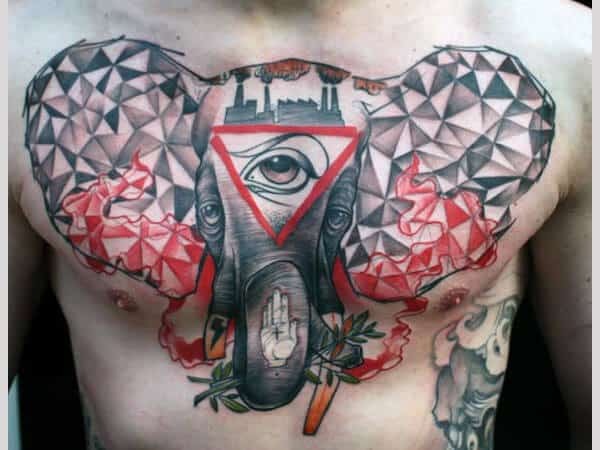 Yet another awesome tattoo for the chest – it is the image of a bull with a human’s body sculpturing itself to form its lower parts. Blue and white are the dominant colors making the tattoo subtle. A pair of horns can be seen extending from the head. This tattoo model resembles a whale swimming vertically. It is medium sized and covers the lower anterior arm decoratively. 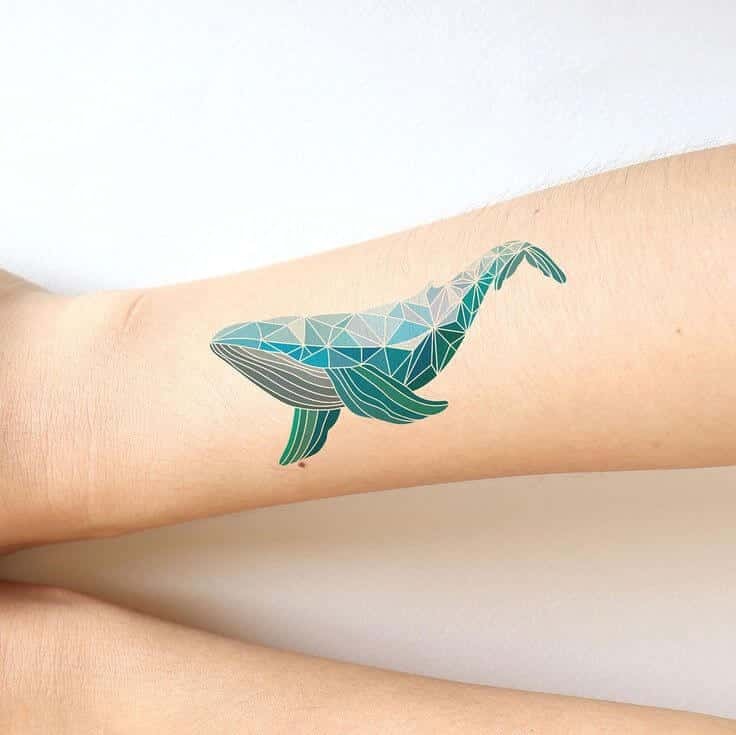 The tattoo comprises of a green netted pattern on the lower side of the whale and a dull pattern on the upper part, separated by the lateral line. Here is another scary tattoo on the upper part of the lower arm. It is the image of a furious woman’s face that has some snake-like extensions protruding from the upper and lower parts of the head. The mysterious element holds its aesthetic value and quality.